A group of lead­ers in the solar indus­try have been hold­ing secret meet­ings for the last 14 years, strate­giz­ing how to make solar the dom­i­nant source of energy on Earth. 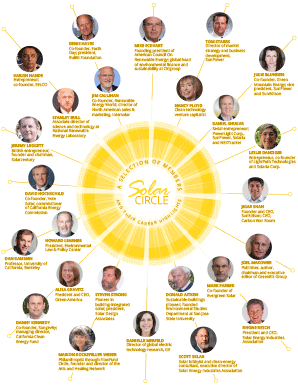 Called the Solar Cir­cle, it is a quiet sort of brain trust made up of mem­bers hand-​​chosen for their tal­ents and com­mit­ment to the cause (see side­bar). It has sys­tem­at­i­cally explored and sought to improve every aspect of the sup­ply chain, play­ing a behind-​​the-​​scenes role as solar trans­formed from a hip­pie curios­ity into the fastest-​​growing source of new energy on the power grid. Twice a year, the group meets like clock­work, despite hav­ing no bud­get, no legal struc­ture and no staff. Mem­bers travel on their own dime to week­end retreats that have been held every­where from Maine to Mex­ico. And now, after years of brain­storm­ing ses­sions, deep dives into pol­icy and finance, and late-​​night gui­tar ses­sions, the cir­cle has matured from indus­try asso­ci­a­tion into some­thing else. “It has become akin to a fam­ily,” said Denis Hayes, a founder of Earth Day and an early direc­tor of what would become the Depart­ment of Energy’s National Renew­able Energy Laboratory. Fig­ure: A selec­tion of Solar Cir­cle mem­bers and promi­nent posi­tions they’ve held in their careers. The ros­ter includes both active and inac­tive mem­bers. Graphic by E&E Pub­lish­ing. Pho­tos cour­tesy of: LinkedIn, Flickr, Wikipedia and mem­bers’ websites. The group, founded by 30 rep­re­sen­ta­tives from every slice of the solar value chain, is exceed­ingly diverse. Mem­bers are entre­pre­neurs, phil­an­thropists, engi­neers, man­u­fac­tur­ers, ven­ture cap­i­tal­ists, archi­tects, project devel­op­ers, activists, lob­by­ists, physi­cists, jour­nal­ists and pol­i­cy­mak­ers, and spe­cial­ists in most tech­no­log­i­cal means of deriv­ing energy from the sun, as well as adja­cent fields like wind power. While the group’s thrust is Amer­i­can, it has had del­e­gates from India, Japan, Ger­many, Great Britain and Hong Kong, and includes inno­va­tors who designed the pil­lars of today’s solar landscape. Many of the founders have been active in solar for decades and are now retired or approach­ing the end of their careers. They have been sup­ple­mented by new­com­ers who bring the ros­ter of inac­tive and cur­rent mem­bers to about 50. The coterie’s older mem­bers include Steven Strong, an archi­tect who installed solar pan­els on the George W. Bush White House; Stan­ley Bull, a for­mer asso­ciate direc­tor of the National Renew­able Energy Lab­o­ra­tory; and Mike Eck­hart, the found­ing pres­i­dent of the Amer­i­can Coun­cil on Renew­able Energy and now the head of envi­ron­men­tal finance and sus­tain­abil­ity at Cit­i­group. Other, younger mem­bers are in the thick of today’s tur­bu­lent solar mar­ket, like Danielle Mer­feld, a tech­nol­ogy direc­tor at Gen­eral Elec­tric Co.; Tom Starrs, a vice pres­i­dent of solar panel man­u­fac­turer Sun­Power Corp.; Rhone Resch, the recently departed head of the Solar Energy Indus­tries Asso­ci­a­tion; Danny Kennedy, a founder of solar rooftop installer Sungevity (Ener­gy­Wire, Feb. 4); and David Hochschild, a mem­ber of the Cal­i­for­nia Energy Commission. The cir­cle was founded in 2002, when the notion of solar play­ing a seri­ous role on the elec­tric grid was enough to make a con­gress­man laugh. Solar pan­els were those things that got attached to satel­lites and blasted into space. The circle’s recruits were early believ­ers in the sci­ence of cli­mate change and had a fer­vent hope that solar could replace the carbon-​​spewing coal plants that formed the country’s energy back­bone. But their indus­try — if it could even be called that — was so small and frag­mented that many of its mem­bers had never met. Now most are aston­ished at how fast and how large solar has grown. Since the circle’s found­ing, the price of an installed res­i­den­tial rooftop solar sys­tem has dropped from $11 a watt to less than $4, and the solar indus­try employs over 200,000 Amer­i­cans, more than the num­ber who work in oil and gas extrac­tion (Ener­gy­Wire, Jan. 12). Solar farms pro­duce only a slim frac­tion of U.S. elec­tric­ity — six-​​tenths of 1 per­cent as of last year, accord­ing to the U.S. Energy Infor­ma­tion Admin­is­tra­tion — but adop­tion is sky­rock­et­ing. If trends hold, this year will see solar bring more new capac­ity to the U.S. grid than any other source. That accel­er­a­tion has some mem­bers of the cir­cle won­der­ing whether they still have a role to play. On one hand, solar has scaled to a size they could scarcely imag­ine; on the other, it has a long way to go if it is to meet the group’s pro­fessed goal of rul­ing the world’s energy system. In any case, the cir­cle has tapped its mem­bers into an energy source they could find nowhere else. The group hop­scotches across the coun­try, alter­nat­ing between the East and West coasts, seek­ing out nature retreats and organic food when it can. It has con­verged near a space obser­va­tory in the Col­orado Rock­ies, at a con­vent, at an eco-​​conference cen­ter out­side Wash­ing­ton, D.C., and sev­eral times at Asilo­mar, the famed meet­ing spot on the cen­tral Cal­i­for­nia coast. Mem­bers have brought their fam­i­lies to Hawaii and met on the shores of Mexico’s largest fresh­wa­ter lake. On a Fri­day night in the sum­mer of 2002, at a resort on Wisconsin’s Lake Geneva, about three dozen peo­ple pulled up their chairs for a strange meet­ing. Most of the faces in the room were unfa­mil­iar. They had been sum­moned here by a stranger, and they had no idea what sur­prises awaited them. It was the first meet­ing of the Solar Cir­cle, a group of indus­try lead­ers that would go on to meet twice a year, every year, for 14 years and count­ing, play­ing a sub­tle role in bring­ing solar mainstream. Six months ear­lier, a Hong Kong busi­ness­man named Robert Sher­riff had had a vision. He’d had an expe­ri­ence with a healer that made him real­ize his pur­pose in life: to con­vene a group of lead­ers who could make solar the dom­i­nant source of energy on Earth. To make it real, he got on a plane and booked an urgent meet­ing with a woman in Milwaukee. That woman was Susan Davis. She’d had an eclec­tic career in finance and pub­lish­ing, and two years ear­lier she had started a com­pany, KINS Inno­va­tion Net­works, with an unusual process for cre­at­ing pro­fes­sional groups. Sher­riff put up a sum to get the group started, which grew to $60,000 with the help of other donors, includ­ing Mar­ion Rock­e­feller Weber, an heir to the Rock­e­feller oil fortune. Davis’ goal was very spe­cific. She had six months to bring together exactly 30 world lead­ers in solar, an indus­try of which she had no par­tic­u­lar knowl­edge. They needed to rep­re­sent 30 con­stituen­cies from every aspect of the sup­ply chain, from inven­tion to pro­duc­tion to pol­icy to media, and have an unswerv­ing com­mit­ment to the solar cause. Fur­ther­more, they had to share a par­tic­u­lar out­look on life. In her career, Davis has set up 26 such cir­cles. Most are pri­vate, and some are defunct, but some con­tinue to meet and are pub­lic, like the Com­mit­tee of 200, which is now a group of 400 top busi­ness­women, and the Chicago Net­work, as well as the Investors’ Cir­cle, the country’s largest group of social-​​responsibility angel investors. Mem­bers of the cir­cle say they jelled in no time. “The chem­istry of the Solar Cir­cle mem­bers was felt imme­di­ately and over­whelm­ingly,” wrote Mike Eck­hart, who at the time was the found­ing pres­i­dent of the Amer­i­can Coun­cil on Renew­able Energy and is now the global head of sus­tain­abil­ity and envi­ron­men­tal finance at Citigroup. The group spent Sat­ur­day doing an analy­sis of the chal­lenges and oppor­tu­ni­ties of the solar indus­try and under­stand­ing what each person’s role was within it, mem­bers of the cir­cle said in inter­views. They estab­lished a set of guide­lines that were at once min­i­mal and durable: They would for­mally meet for a week­end twice a year, at their own expense, once on the West Coast and once on the East Coast. Sev­eral peo­ple invited to that first meet­ing did not con­tinue, includ­ing William McDo­nough, an archi­tect and well-​​known author on sus­tain­abil­ity; Chris­tine Ervin, the first CEO of the U.S. Green Build­ing Coun­cil, which cre­ated LEED, the world’s most com­mon sustainable-​​building stan­dard; Her­mann Scheer, now deceased, a giant in Germany’s adop­tion of solar power and a mem­ber of Germany’s Bun­destag; Glenn Hamer, a for­mer head of the Solar Energy Indus­tries Asso­ci­a­tion and now CEO of the Ari­zona Cham­ber of Com­merce and Indus­try; Chet Far­ris, a for­mer head of Royal Dutch Shell PLC’s solar pro­gram and now CEO of Stion, a Sil­i­con Val­ley thin-​​film solar com­pany; and Dan Reicher, who was an assis­tant sec­re­tary of Energy dur­ing the Clin­ton pres­i­dency and would go on to head Google’s energy and cli­mate initiatives. That night, the group started to bond in other ways. Other times, they come together at mem­bers’ offices, such as in Seat­tle (at the Bul­litt Cen­ter, run by Hayes); Oak­land, Calif. (head­quar­ters for Sungevity, co-​​founded by Kennedy); and Chicago, at the offices of Howard Learner, the exec­u­tive direc­tor of the Envi­ron­men­tal Law & Pol­icy Center. Everyone’s con­tri­bu­tion is dif­fer­ent. Hochschild tees up tan­ta­liz­ing polit­i­cal con­ver­sa­tions. Joel Makower, the founder of Green​Biz​.com, who attended in the early days, coun­seled on how to expand the group’s mes­sage to the larger energy indus­try. Julie Blun­den, a for­mer vice pres­i­dent of SunEdi­son and Sun­Power, deliv­ers a detailed talk on the finan­cial state of the indus­try, while Don­ald Aitken, an edu­ca­tor and sus­tain­able build­ing expert, gives the lat­est on cli­mate change. Bar­bara Har­wood, an advo­cate for afford­able energy-​​efficient homes, was a deep thinker who spoke rarely; Dan Shugar, one of the most suc­cess­ful ser­ial entre­pre­neurs in solar, is known for yelling and pound­ing the table when he gets worked up. Most con­ver­sa­tions revolve around pho­to­voltaic solar power on the U.S. power grid. But some mem­bers doggedly remind their col­leagues that there are plenty of other ways to pro­duce solar power and many other places that need it. A con­stant topic of dis­cus­sion has been finance and how solar power can become afford­able. That dis­cus­sion, led by such mem­bers as Blun­den, Shaw and Eck­hart, is where many of the circle’s mem­bers say they got their most valu­able money lessons. How could the young indus­try stim­u­late man­u­fac­tur­ing? How about green banks, which make low-​​cost loans to low-​​carbon projects? That lat­ter topic was explored by Alisa Gravitz, the CEO of non­profit Green Amer­ica, who served as mod­er­a­tor for the group’s early meet­ings. Other ses­sions dis­sected the anatomy of the yieldco, a renew­able energy finance instru­ment that has now fallen on hard times. “There was a rig­or­ous atten­tion to the costs of solar, very care­ful track­ing, where the choke­points are, where the points of lever­age are,” said Bracken Hen­dricks, for­mer exec­u­tive direc­tor of the Apollo Alliance, a group that in the early 2000s sought to rally labor and envi­ron­men­tal groups around renew­able energy. To under­stand the circle’s value, con­sider what hap­pened when Strong showed off about his solar buildings. Strong is a little-​​known but influ­en­tial archi­tect. His com­pany, Solar Design Asso­ciates, cre­ated the United States’ first entirely solar-​​powered house and the first solar-​​powered sports sta­dium (for the San Fran­cisco Giants), and installed pho­to­voltaic solar pan­els and a solar hot water sys­tem at Bush’s White House, on an out­build­ing. At one meet­ing, he proudly gave a slideshow of arrays he had placed on U.S. embassies. His col­leagues weren’t entirely impressed. Every mem­ber inter­viewed for this story said the same thing: The chance to share rough-​​hewn ideas and get unvar­nished feed­back made the cir­cle invaluable. “It’s a group that is inter­nally pretty crit­i­cal of mis­steps,” said Dan Kam­men, an energy pro­fes­sor at the Uni­ver­sity of Cal­i­for­nia, Berke­ley. Cir­clers felt safe shar­ing sen­si­tive infor­ma­tion — the prices of solar mod­ules, the val­u­a­tions of com­pa­nies — because con­ver­sa­tions were off the record and mem­bers came to learn they could trust each other. Par­tic­i­pants also cher­ish the “cal­i­bra­tion exer­cise” held on Sat­ur­day morn­ing, when each mem­ber gives an update on how things look from his or her part of the indus­try. No other venue exists where mem­bers get a 360-​​degree view of what’s going on. After­ward, the group fol­lows an agenda through the rest of the week­end that includes small group ses­sions, pre­sen­ta­tions and discussions. Secrecy has been essen­tial to the circle’s suc­cess, mem­bers said, though secrecy might be the wrong word; “hid­ing in plain sight” is more like it. Some mem­bers men­tion the cir­cle on their web­sites or LinkedIn pro­files, with­out elab­o­ra­tion. “It has not had any vis­i­bil­ity, and it has not sought any vis­i­bil­ity,” Hayes said. By meet­ing out of the pub­lic eye, mem­bers said, they are able to speak freely. Ener­gy­Wire learned of the circle’s exis­tence from a chance com­ment of one of its mem­bers at a pub­lic meet­ing last fall. 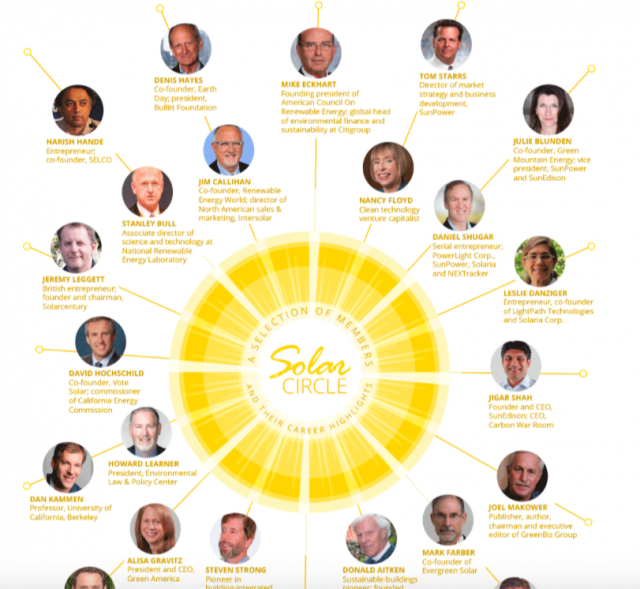 Since then, 19 mem­bers have gone on the record to tell the Solar Circle’s story. Many said the cir­cle has been able to stay so low-​​profile for so long because of a fierce com­mit­ment to keep its con­tainer tight, as well as a trait that is com­mon in the cir­cle but rarely found among those at the top of an indus­try: humil­ity. The group has self-​​selected for mem­bers dis­in­clined to boast or brag. Among the addi­tions have been Kennedy and Blun­den, as well as Jigar Shah, the founder of solar devel­oper SunEdi­son, and Mer­feld of GE, who caught the atten­tion of Shaw when she gave a talk at Cor­nell University. The group has no mem­bers from newer com­pa­nies in the clean energy space that come clos­est to being house­hold names, such as Tesla, Sun­run Inc. and SolarCity Corp.
A guest speaker or two can be found at almost every retreat. Once, the guest was a Stan­ford pro­fes­sor who pro­posed a road map to the U.S. get­ting 100 per­cent renew­able energy (Cli­mateWire, June 2); another was a social media expert from Pres­i­dent Obama’s first pres­i­den­tial cam­paign. Often it is a local politi­cian who can give the group a ground-​​level view, such as Jay Inslee, who spoke before the group when he was a con­gress­man and is now the gov­er­nor of Washington. Some­times the guest stirs things up. In 2004, the cir­cle invited Mar­vin Kesh­ner, a direc­tor at Hewlett-​​Packard Lab­o­ra­to­ries, who pro­posed an idea that aston­ished the circle. Keshner’s pro­posal was pre­scient. Mas­sive fac­to­ries that pro­duce gigawatts of solar mod­ules a year did get built — in China. The cost of an installed solar sys­tem may reach $1 a watt — by 2020. And one U.S. com­pany is attempt­ing to steal back China’s lead with a solar “gigafac­tory.” Its name? SolarCity. The group briefly con­sid­ered mount­ing a man­u­fac­tur­ing effort like Kesh­ner sug­gested but changed its mind after it real­ized how much that would cost. The cir­cle was a venue where excit­ing prospects first entered the minds of some of the industry’s lead­ing lights. Ideas are bandied about, in the leisure of a con­ver­sa­tion among equals, with lit­tle attempt to make them con­crete. Thus the Solar Cir­cle has served as a sort of salon for the solar indus­try, direct­ing intel­lec­tual heat onto promis­ing ideas that sub­tly per­co­lated out­ward, often at the state level. The cir­cle counts among its mem­bers some of the archi­tects of today’s solar land­scape. Starrs, the Sun­Power vice pres­i­dent, orig­i­nated key parts of net meter­ing, which com­pen­sates small-​​scale solar gen­er­a­tors, like homes, for the power they sup­ply the grid — a propo­si­tion that now under­lies the finan­cial value of much of the country’s fleet of rooftop solar pan­els. Aitken helped draft the first renew­able port­fo­lio stan­dards, which are now in place in a major­ity of U.S. states. Shah of SunEdi­son pio­neered the power pur­chase agree­ment, the model that is used by util­i­ties and busi­nesses to con­tract the power from renew­able energy power plants. The cir­cle often lends a hand to a mem­ber in need. Oth­ers, like Kam­men, dis­cov­ered the power of the circle’s net­work. An intro­duc­tion from another cir­cle mem­ber brought two startup founders into the professor’s office. Kam­men was impressed and became chair­man of the startup’s research board. Today that com­pany, Enphase, dom­i­nates the mar­ket for microin­vert­ers, which con­vert direct cur­rent to alter­nat­ing cur­rent at the point of the solar panel and have become a key link in smart and effi­cient solar arrays. But con­ver­sa­tions are ephemeral, and even the circle’s own mem­bers don’t agree on whether they have had an impact. “I think that key lead­ers within the indus­try were able to be sig­nif­i­cantly more effec­tive and nim­ble and cre­ative and timely because of the circle’s exis­tence, and I can’t help but believe that the incred­i­ble suc­cess of the solar indus­try has been greatly sup­ported by the exis­tence of the cir­cle,” said Hendricks. What does a group ded­i­cated to dom­i­nance do when it finally starts to win? That is the exis­ten­tial ques­tion fac­ing the Solar Cir­cle and its mem­ber­ship. For years, the group won­dered how to get celebri­ties and reli­gious lead­ers to speak about cli­mate change and renew­able energy; in the last year it got just that, from Leonardo DiCaprio to Pope Fran­cis (Cli­mateWire, Jan. 20; Green­wire, Sept. 25, 2015). Mem­bers strate­gized how to speed the adop­tion of rooftop solar; ear­lier this year, the U.S. sur­passed a mil­lion solar installations. Now that solar is matur­ing into a com­plex global enter­prise, the hori­zon is filled with other ques­tions: How will gigawatts of inter­mit­tent solar power be stored? Can home or industrial-​​size bat­ter­ies get cheap enough to do it? Can elec­tric cars? Can the hub-​​and-​​spoke elec­tric grid be flat­tened into a mesh, mak­ing a thou­sand rooftop solar pan­els as valu­able as a cen­tral­ized coal power plant? Mem­bers of the group are quick to point out that it’s still early days for solar. “When there’s solar energy on every build­ing you look at, our job might be done then,” said Guiney. Some cir­cle mem­bers, par­tic­u­larly the younger ones, think the cir­cle could play a role in trans­form­ing the world’s energy sys­tem into one that revolves around the sun. But before dom­i­na­tion comes defense. One of the solar industry’s key pol­icy tenets, net energy meter­ing, is under attack by cli­mate deniers and “util­i­ties who think they own the elec­tric­ity world,” said Shaw. Nevada gut­ted its net-​​metering pol­icy last year, argu­ing it is a hid­den penalty on cus­tomers who don’t gen­er­ate their own power. Another key pol­icy tool, the renew­able port­fo­lio stan­dard, seemed to be on a path toward bring­ing ever more renew­able power to ever more states — until recently. In the last year, stan­dards have been scrapped in Kansas and West Vir­ginia and have stalled in Ohio and Maryland. In other ways, solar is “so suc­cess­ful that we caused a new prob­lem,” Shaw said. In Cal­i­for­nia, by far the leader in inte­grat­ing renew­ables onto the power grid, out­put from solar and wind farms has spiked at times of day when demand for power is the low­est — the so-​​called duck curve — which has caused the grid oper­a­tor to shut down deliv­er­ies (Ener­gy­Wire, May 2, 2014). The cir­cle, founded with 30 mem­bers, now has meet­ings attended by between a dozen and 20 reg­u­lars. Many of the orig­i­nal mem­bers have stepped away, and some refer to it in the past tense. Some, like Kam­men, believe the cir­cle has been over­taken by events; he has stopped going, he said, because he can see the same peo­ple and have the same con­ver­sa­tions at the energy and cli­mate con­fer­ences that crowd the cal­en­dar these days. Oth­ers find that time is over­tak­ing them. At a meet­ing last year, the cir­cle mourned the pass­ing of three spouses. One was Har­wood, who was a cir­cle mem­ber along with her hus­band, Aitken. He still makes it to all the meet­ings he can, because both the topic and the peo­ple are close to his heart.